PhNOG core committee members Benjz Sevilla (left), Achie Atienza (2nd from right) and Bani Lara (right) with APNIC's Sheryl Hermoso. 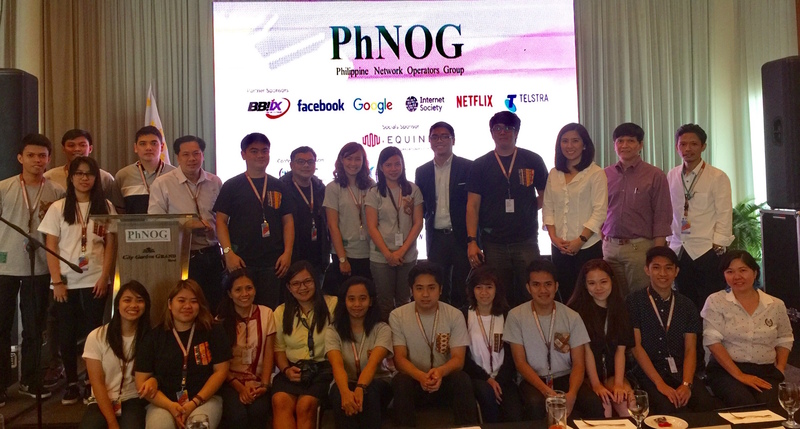 The Philippine Network Operators Group 2017 conference – PhNOG 2017 – marked a renewed phase of volunteerism and collaboration for the Philippines networking community. The three-part, week-long event was made up of the main conference (6 March), the 1st Philippine IP Peering Forum (7 March) and workshop/training (8 to 10 March). The conference theme, “Our Philippine Internet”, embodied everyone’s contribution to the growth and evolution of the Philippine Internet, as well as the local and foreign support required to plan, sponsor, manage and attend the event – many foreign delegates re-arranged their flight to attend this event after the previous week’s APRICOT 2017 conference in Viet Nam. Unknown to most, this was PhNOG’s first stand-alone event; all previous PhNOG events were in conjunction with other organizations’ events, most recently APNIC’s Regional Meeting in 2015 and APAN 41 in 2016. It was also the first two-day (major) event, including a one-day conference followed by a one-day peering forum, both of which were free to attend, including the closing social on day two. Group photo PhNOG committee and young volunteers. Overall it was a real community effort; the event would not have been possible if not for the support of our sponsors and volunteers. Our volunteer committee was composed of volunteers from APNIC, APIA, DICT, DOST-ASTI, ConvergeICT, Eastern Communications, Globe Business, IECEP and PLDT Enterprise. The involvement of many local operators, students and young professionals who took part in the volunteer committee is also a great sign of the diversity and youth of our community. Special mention also to my Core Committee colleagues Bani Lara/DOST-ASTI and Benjz Sevilla/DICT. We look forward to seeing you again later this year for our next meeting in Davao City. Achie Atienza is Senior Product Manager and IP Peering/Interconnection Manager for Globe Telecom and co-chair of PhNOG.